By esiegel on May 27, 2012. But the apocalypse will soon be upon us. ?And I think that this cute fella may be just the thing that ushers it in. NAO robot, courtesy of Aldebaran Robotics, retrieved from UNC-Wilmington. 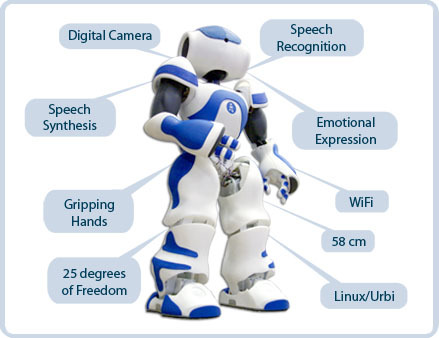 The NAO robot, made by Aldebaran Robotics, is one of the most advanced humanoid robots out there. ?Yes, it's programmable, it can do choreographed movements, it can respond to stimuli, and it can change what it's doing dependent on its surroundings. ? With 25 degrees of freedom -- meaning 25 different, individually programmable moving parts -- it can engage in a huge suite of possible movements. 25 degrees of freedom on NAO, via Aldebaran Robotics. But one of the most difficult challenges for robots has been the ability to synchronize with one another. ?Rather than engage in some pre-programmed, animatronic-type sequence, would it be possible to teach these robots to synch up when the unexpected occurs? ?This was the exact problem that Patrick Bechon and Jean-Jacques Slotine at MIT took on, in an attempt to keep robots in synch when one or more was diverted off-task. But through an approach used in bacterial colonies -- dubbed quorum sensing -- where organisms change the pace at which they do things to move closer to the average, robots can slow down when one falters, allowing the faltering one time to right themselves, synch back up, and quicken their movements to match the rest of the group. ?Shown below, dancing to Michael Jackson's Thriller, these NAO robots do what I've never seen robots successfully do before. So it's not just robots, now, but literally an army of zombie robots. ?I'm sure I'll be sleeping easy tonight. Algebra For Everyone, Even the Math-Phobic! 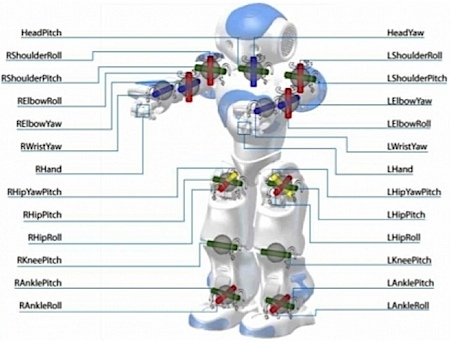 Somebody better teach these chaps Asimov's Rules of Robotics real quick! Earlier today I was reading a piece that noted that in March 1953, the world had a grand total of 53 kilobytes of RAM spread over a dozen or so computers, Then I came here and saw this. It is an amazing display. I don't know if we will make it to the singularity before mankind falls to skynet or the zombie apocalypse. Until then, I plan to enjoy watching the future unfold. Weekend Diversion: A contest, an upgrade and a chance to see me LIVE!